Update For my Family & Friends! 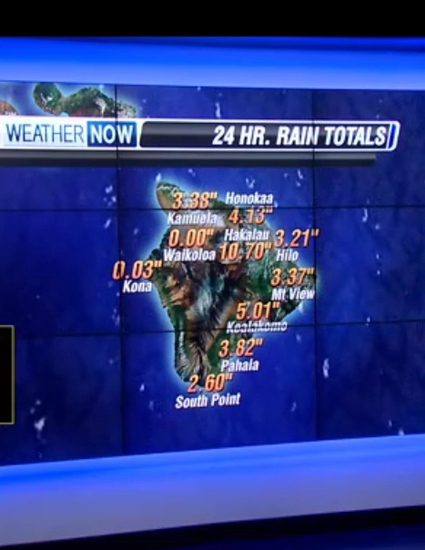 We received much stronger winds than our usual, and powerful gusts were pushed through Waikoloa with force! But in our little sheltered “cradle”, we had no major issues unlike those on the East, South, and North areas of the Island. 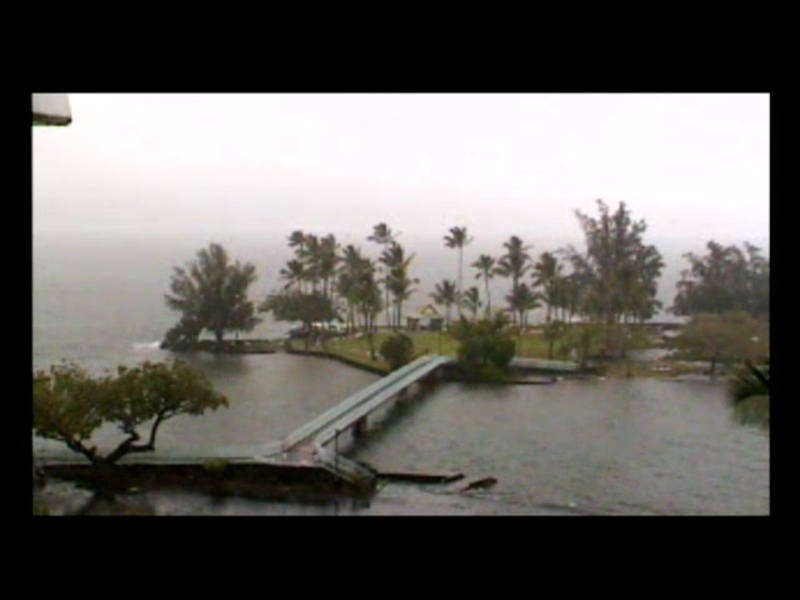 I understand that Kona is now getting quite a bit of wind and rain on the West, too! The inches upon inches of rain that have hit and are hitting other parts of the Island went around us, due in large part to the Mauna Kea mountain shadow effect! Not such a bad thing to be nestled close to the base of a nearly 14,000 foot tall mountain! 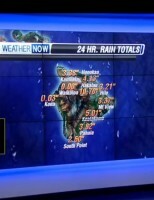 😀 Now we watch Hurricane Julio, and see where the “winds” carry! Surprisingly, I didn’t see or hear news in the media of the ~Mag 4.5 Earthquake that occurred in Kohala at ~6:21am on Thursday morning the 7th of August! 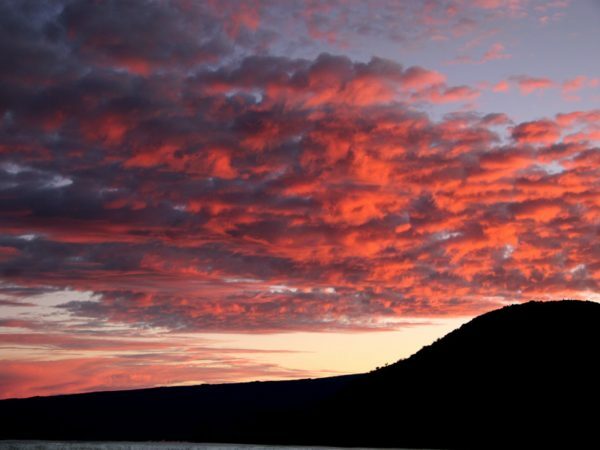 Follow this Link (Live from the Mauna Kea Summit on June 5, 2012!) to the live view of the June 5, 2012 Venus Transit “across” the Sun! 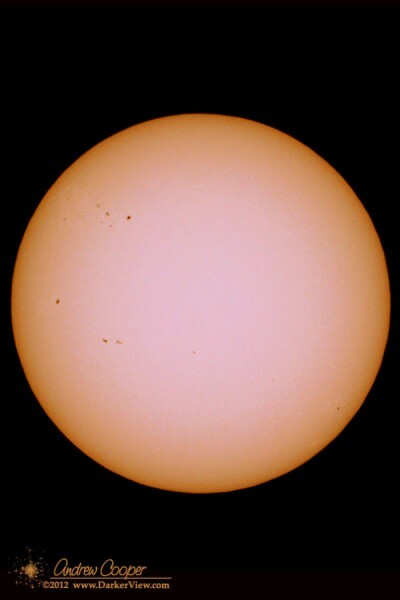 The Sun on June 2, 2012, photo taken with a Canon 60D, AT6RC telescope and a Baader solar film filter. Photo by Andrew Cooper. Providing there are GOOD viewing conditions [fingers crossed for Good Luck, PLEASE], W. M. Keck Observatory is streaming video of the Venus Transit all day on June 5, 2012 Hawaii Time from their Mauna Kea Summit situated Observatories! You can also keep up with the events at Keck Observatory here –> Keck Observatory on Facebook! I watched some of the dry run today as Andy tested, tweaked and tested some more. It will be VERY cool providing their bandwidth will handle the viewer load for the day, you can watch it at the link above as much as you want to “tune” in or for as long as you have time for 😀 Drop by A Darker View now and then where Andy is posting many articles about the Transit as well as many other interesting tidbits of trivia and information 😀 Do remember to look down occasionally to be sure your feet are still on the ground 😉 HAPPY STAR GAZING!!!! Andy (Darkerview.com) and I attended the 17th Annual Hakalau Forest National Wildlife Refuge (NWR) Open House that was held on Saturday, October 17th 2009! A PDF of the Open House News Release from the U. S. Fish & Wildlife Service showed how to get there and what to see when you get there. It is my understanding that the NWR will continue to hold one of these every year. I am anticipating attending the open house again next year! I still need to get to the greenhouse to explore the seedlings that they are propagating to bring back endemic species like the Koa tree (Acacia koa) while they eradicate the invasive plants. 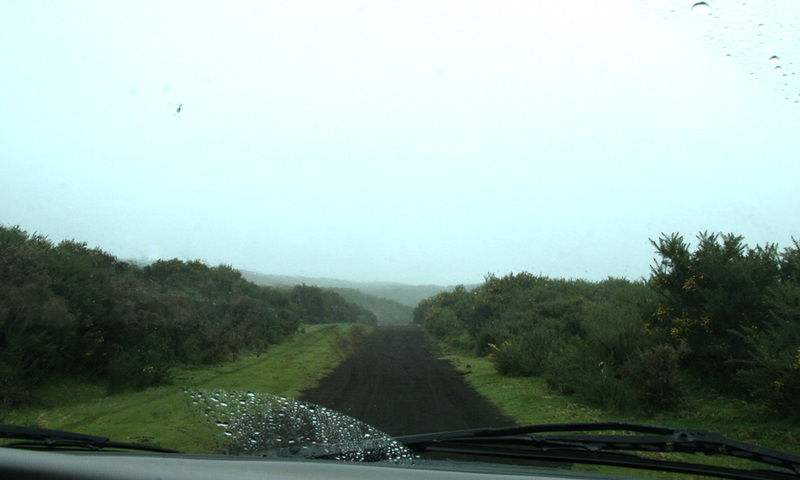 Mana Road resembling many 4-Wheelin’ roads taken in Arizona, except for the fog, the drizzle; and the intensely green foliage of the all too Common Gorse. Except for the dense fog, heavy drizzle and generous amounts of green foliage, the bumping bouncing drive to the event was reminiscent of many of the roads that we explored in Arizona with the same 4-wheel drive. 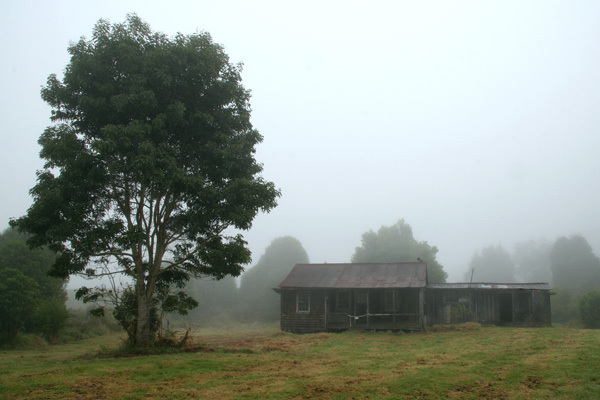 For the first few hours of our visit to the reserve, the sky was overcast and drizzly; and the sun was barely able to light the landscape through the fog. The road started as a narrow, graveled and tolerably maintained course; and then took on a different character as it changed to steep, well rutted stretches of trail among the curves and hills. The sections that were most susceptible to erosion were paved to prevent complete washout and inaccessibility to the refuge and the nearby ranches. We took our time on the drive in to take in the beauty of it all, despite the heavily invasive, and thick growth of that pretty yellow flower on that bushy evergreen plant that I now know as Common Gorse (Ulex europaeus). It was EVERYWHERE! An invasive in Hawai’i. Gorse is so dense that it chokes out nearly every other plant in its wake. While Gorse may have its place in the RIGHT place, its attempt at world take over is better left out of Hawai’i. The backside of Pua ‘Akala Cabin & remnants of garden furrows. The Gorse that was so prolific on both sides of the nearly 16 miles of Mana road, basically disappeared when we turned in the gate to Pua ‘Akala Barn and event parking. Eradication of the Gorse and reestablishing Koa trees is part of the mission of Hakalau Forest NWR as well as preserving endangered native species (See Management for detailed information). While on the refuge grounds, I noticed only one pitiful instance of Gorse that was showing signs of giving in to the eradication effort. And numerous young Koa trees getting their roots established! 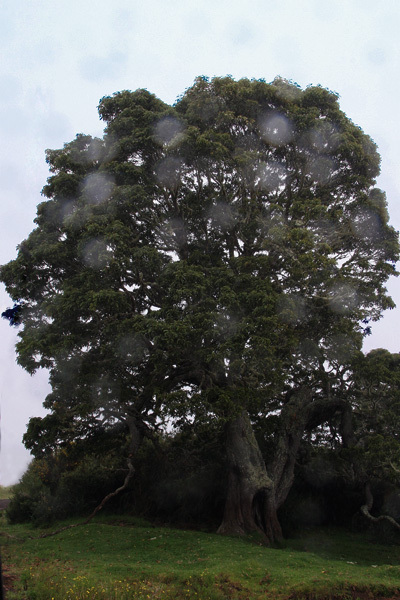 The effects of raindrops on my lens: An old tree in Hakalau appears to protect Spirits. When we reached the main demonstration area, we started with the barn area where there were storyboards, pamphlets, and loads of information about the reserve. 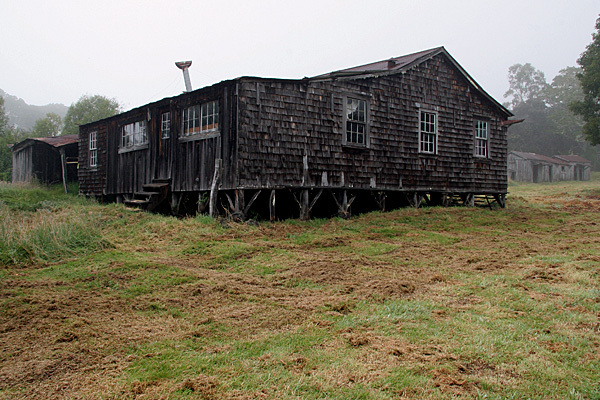 Then we moved on to the historic Koa wood Pua ‘Akala Cabin (built in 1883 and used up until about 1980), and the equipment shed that was very near the cabin. It was wet and overcast during our exploration of the buildings (the cabin with its temperature controlled fermentation room and the barn with a unique water catchment system). This provided a diffuse lighting and prevented harsh shadows; although, it was quite the challenge to get an acceptable photo before the lens was covered with water droplets. Cliff Livermore’s newly refinished 24″ dob in heavy use after a successful Gecko eviction & assembly completion. Background Information: On March 27, Cliff Livermore brought his 24″ newly refinished Dobsonian telescope to the VIS at 9200 feet to use while participating in the 2009 Messier Marathon. (Refer to the postings on A Darker View, Mauna Kea Visitor Information Station (the VIS) and my blog right here, Gadget Gypsy, for more in depth details of the whole 2009 Messier Marathon event at the VIS). Cliff is one of several of us who brought our telescopes for this marathon; but his was the only one that got so much attention and not solely because of the unexpected hitchhiker. You might understand why after examining the photo. An unexpected hitchhiker [Mourning Gecko (Lepidodactylus lugubris)] on the 24″ Primary of Cliff’s newly refinished telescope. 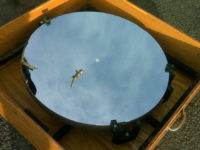 During assembly of the 24″ Dob, the Primary mirror is near the beginning of the checklist in the order of assembly; and when that item on the checklist was reached, the mirror box was carried over and placed in a strategic position near the chosen site to make it easier to place on the “rocker box” for the telescope after the truss tubes and secondary cage assembly have been secured in place. The mirror cover was lifted off of the box and several bystanders erupted into laughter. Cliff had turned to pick up a necessary piece for assembly when he heard the laughter and visibly stiffened a bit. He turned quickly back to his “Primary Gecko” … ummm … I mean his Primary Mirror and joined the chorus of laughter while asking us and the hitchhiker not to move until pictures could be captured! “Yikes! I didn’t call for First Light!,” says a Mourning Gecko (Lepidodactylus lugubris) on Cliff’s 24″ Primary. There was a large Mourning Gecko (Lepidodactylus lugubris) crouched on the very shiny mirror surface! After we had taken multiple pictures and had several viewers of the Mourning Gecko (Lepidodactylus lugubris) on the Primary mirror, it decided to attempt a run for cover. 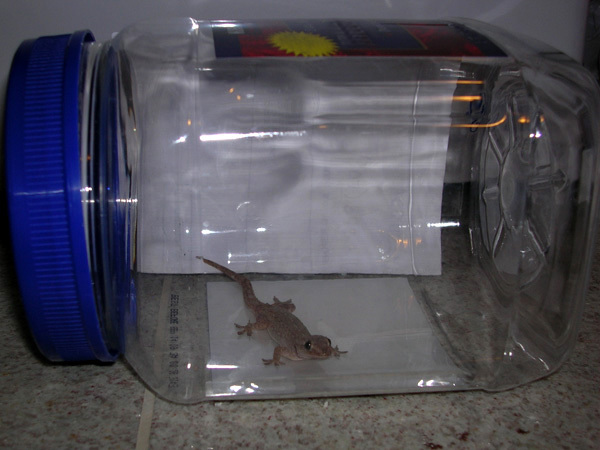 I managed to coerce the cold, confused Gecko into a plastic jar that I thought I had taken up with me to put leftover pecans in after I had opened the new bag :-O I put the jar in a warm spot in the VIS to keep it from getting too cold (or frozen as the temperatures dipped below 32 degrees F) and then took it back to Waikoloa with us. Saturday morning, March 28: Before we headed down the mountain, however, we had breakfast at HP and talked story of the events and happenings of the long, cold and fascinating night. 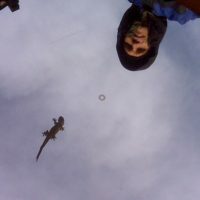 During this time, the Gecko was safely (al beit, a bit cold…no…make that VERY cold) in our vehicle awaiting the journey back to warmer habitat. 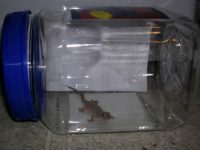 The Gecko got cold enough that it went deep into a state of torpor and appeared to have been taxidermied with all four legs in the air – EEEEW! Although I knew of this state of ‘temporary hybernation’, I had never seen any living being actually in the state of torpor before. It worried me because I hadn’t considered what torpor would actually look like. Breathing slows soooo far that it could easily be mistaken for dead. Mourning Gecko (Lepidodactylus lugubris) awaiting fate. 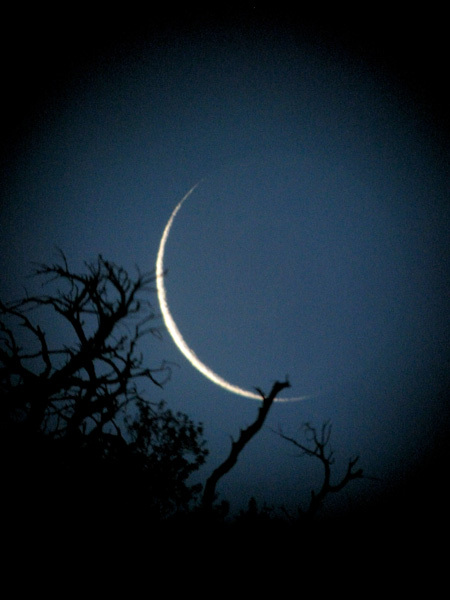 A slim crescent moon setting: a treat to behold while setting up for an all night Messier Marathon at the VIS at 9200 feet. They may have been clouds that Astronomers don’t like; but what a Spectacular Sunset!